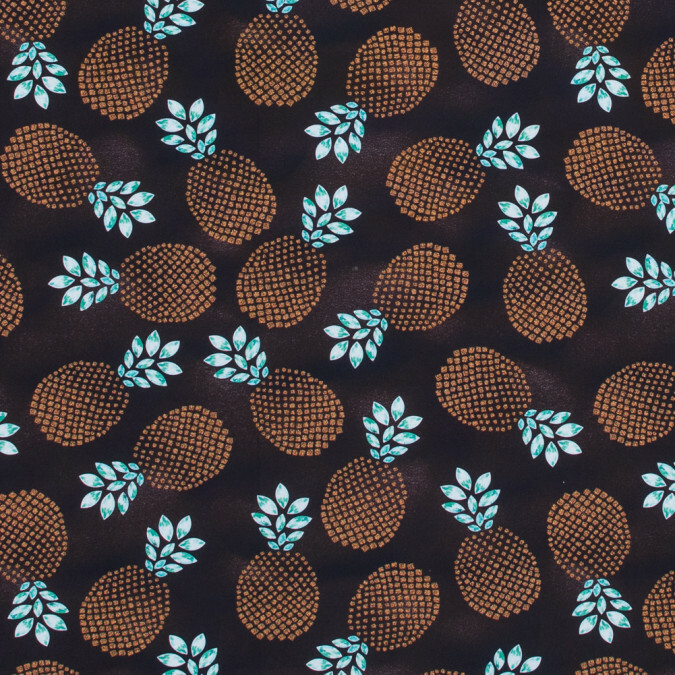 Description No need to pine over this Brown Pineapple UV Protective Compression Tricot with Aloe Vera Microcapsules! Take it home! Comprised with a combination of polyester super microfibers and lycra here is a Max-Dri performance tricot providing a phenomenal 4-way stretch along with superb retention capabilities. Not only is this tricot supreme for articles of active wear such as leggings and shorts due to its high compression fabric structure improving athletic performance but it is also a brilliant option for bathing suits as it comes complete with 50+ UV protection and Aloe Vera Microcapsules for skin hydration. Also keep in mind that this material undergoes Antibacterial treatment which prevents stains and accruing bad odor. Note: Do not machine wash tumble dry iron bleach or dry clean this material. Hand washing is recommended. This material weighs 290gsm.